The Calhoun County Land Bank will host a MayDay! fundraiser at 26 Fremont St on May 1st. The goal is to raise $50,000 to restore the exterior of this Victorian home. This event will include exclusive, unfettered access to all parts of the building and its amazing features. Hors d’oeuvres & wine selections will be provided by Kitchen Proper, a local downtown restaurant. 26 Fremont is the Land Bank’s flagship project in historic preservation. However, funding available for this portion of the project has been limited. 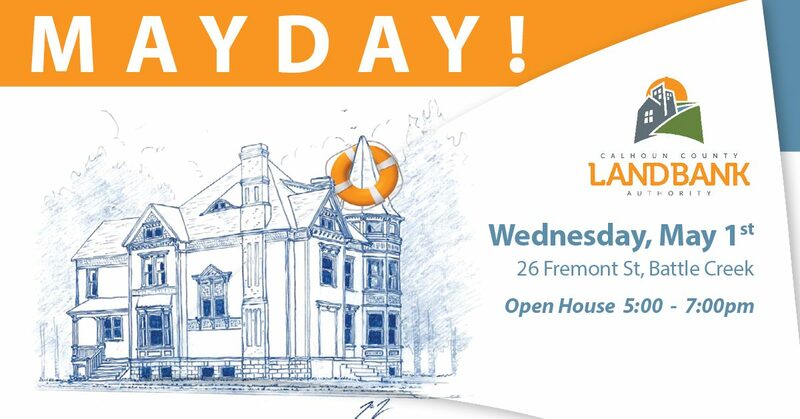 Our “MayDay!” event is a distress call for immediate financial assistance to continue this important project and jump start a program to restore historic homes in our community. Please contact the Land Bank at 269-781-0777 or landbank@calhouncountymi.gov if you have any questions. The 26 Fremont Project has been supported in part by the National Historic Trust, the Michigan Historic Preservation Network and the Battle Creek Community Foundation. All meetings will begin at 3:00pm, and are held in the Garden Level Conference Room on the ground floor of the Calhoun County Building located at 315 W Green Street, Marshall, MI 49068. February 25, 2016 – Meeting cancelled due to inclement weather. No minutes.